The Jedox Data Filter (DFilter) is one of the more important filters that you can use in subsets. 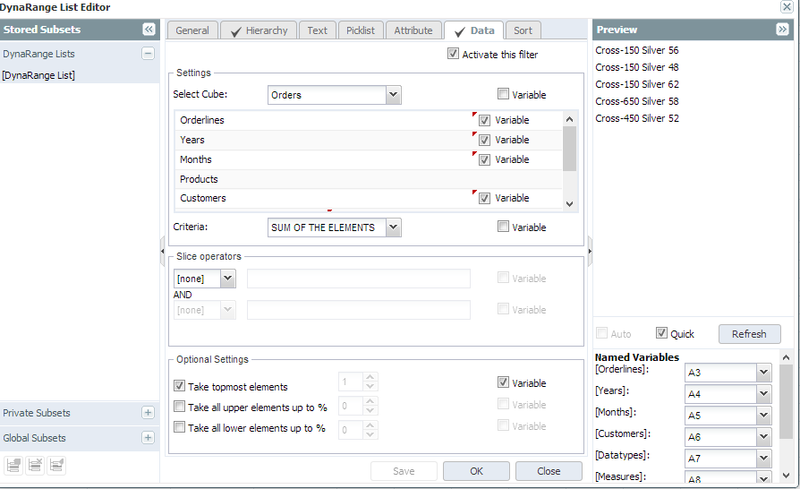 The Data Filter allows you to query the cube dynamically query a cube and order/filter your dimension based on this query. This is really handy when you need to build a report based upon data, such as a top/bottom element listing, a zero suppressed report, or sorting your report based on the data. After you have selected the cube, the next thing to do is to select the dimension elements from each dimension for your dfilter. Finally, you can select calculation options (sum, count the result, etc), specify the top or bottom count or choose how to sort the result. A completed report performing a top/bottom filter and sorting is here. Data filters can really improve the dynamism of your reports and once you start using them , you will find that a lot of reports can benefit by the inclusion of this filter in your subsets. This entry was posted in Jedox Subsets and tagged Jedox Subsets, Jedox Web on December 21, 2013 by Chris Mentor. 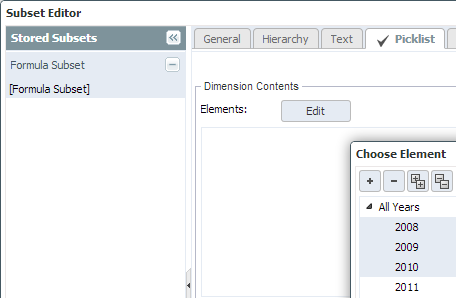 The Hierarchy filter is a major subset type that is usually used in Jedox Web. 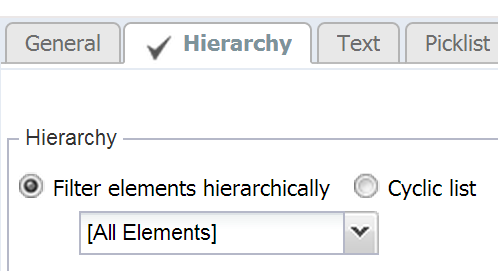 The Hierarchy filters elements in a dimension based upon definitions around a hierarchy. As the meta-data (dimension structures) change in your system, the changes will be reflected wherever you use the subset. Download the sample file here. On the first tab of the examples, I have basically exposed all the variables on the h-filter. Play around and see how they work. You will notice that some of the variables are values in @Value format. These are Jedox Web variables. 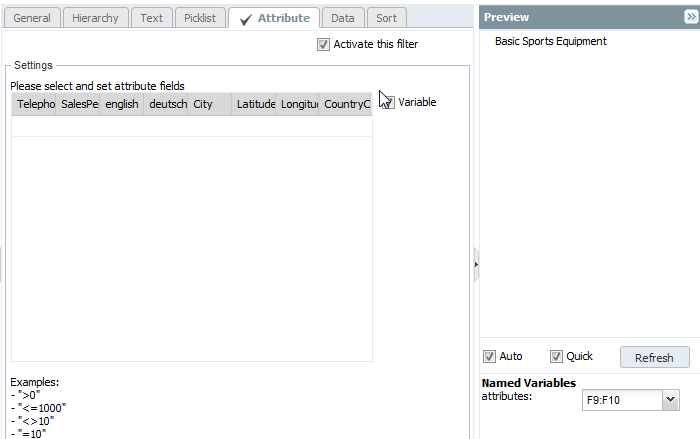 They are user and session related variables that you can populate and share between reports. More on those later. The second tab illustrates the flexibility of Subsets and Dynaranges. The ‘Show Parents Beneath Children” is manually set on the General tab, but it is not a variable option. You can, however, set a flag in the subset formula that gets generated. This entry was posted in Jedox Subsets, Jedox Web and tagged Dynaranges, Hierarchy, Jedox, Subset, Web Reporting on October 29, 2013 by Chris Mentor. 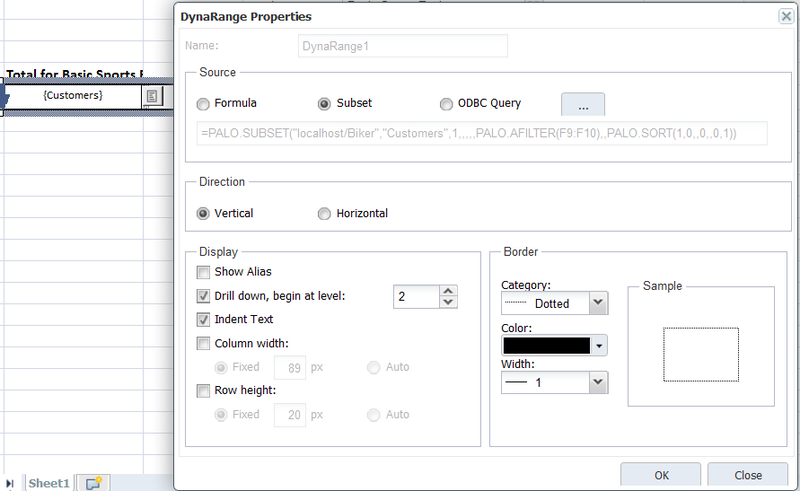 On the Web, with Dynaranges, you can make your report length determined by how the user interacts with the report. Dynaranges allow you to specify a single row of data and then determine what happens to that row when the user interacts with it in report mode. It is a powerful Web component because you can create completely customised, dynamic reports that allows users to explore your data without restrictions while keeping a structure of a formatted report. Dynaranges can be on either columns or rows. This means that both axes of your report can be dynamic. In addition, if you select a subset that contains hierarchical structure, the user can double click to drill down to the next level of the data, and the report will expand automatically. 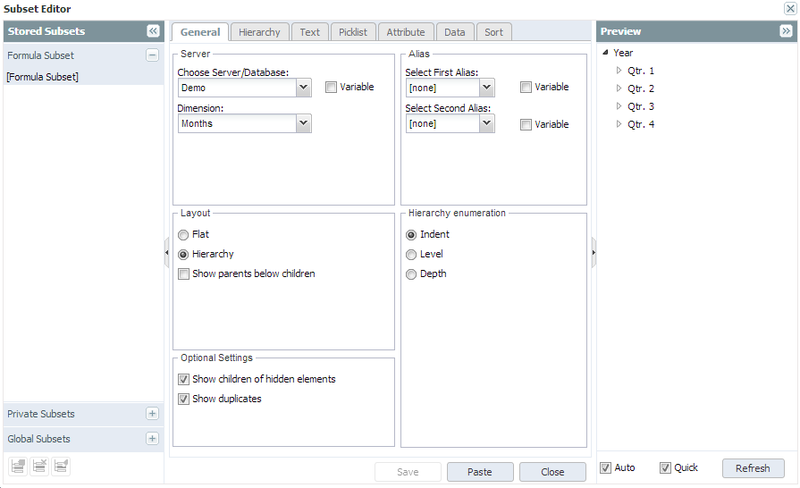 Relational Dynaranges allow you to write a relational (SQL) query via an ODBC connection and return rows of a single column dynamically. You can then use ODBCDATA() functions to pull out the additional columns you require. The report expands and contracts with the data you are returning. Everything in the Dynarange range will be calculated. This means that non-subset values (eg spreadsheet formulas) can be included and the results will be calculated at runtime with the Dynarange. This is a handy dynarow style for filtering a sorting through a dimension with many attributes. 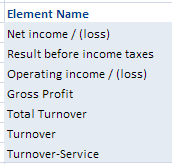 Note: In the example, the elements returned to the second combo box (the attribute data) may be duplicated as it is displaying a value for each element in the dimension. You can remove duplicates only by writing a macro (that is attached to the combo box) to loop through an array of elements and picking out only the unique ones. This entry was posted in Jedox Subsets, Jedox Web and tagged Jedox, Naked Data, Web Reporting on October 21, 2013 by Chris Mentor. This is one usage of Picklists. Another use is to position specific elements in the combo box. Check out the example here. You can see that on the first worksheet, we have a grid of 4 cells where you can enter in valid elements. The drop list will be filtered based on the pick list behavior that you select. The picklist behavior allows you to insert the elements at the front, back, merge (their normal position in the dimension) or subtract (show only those elements you have specified). A more common approach is to use picklist to insert a default element into a combo box. For example, you may want the current month to always show up as the first element in the list. See the second worksheet in the example you downloaded. Here, we calculate the current month (using a now() function wrapped in a text() function) and pass this value into the picklist subset that dives the combo box. The result is that the user always sees the current month as the first element in the drop list when they open the report. This entry was posted in Jedox Subsets and tagged Jedox Subsets, Naked Data on October 9, 2013 by Chris Mentor. The t-filter (or text filter) is the anti-hero of the filter family. Standing in the shadows while the hierarchy and data filters get covered in all the glory, it is not often required to generate dynamic reports. But it is really helpful in adding utility and usability to your reporting suite. Within a subset, a text filter allows you to select all elements that match a certain string criteria. You can use it to generate a list of rows or columns, but where it is really powerful is in filtering out elements for a combo box. When you are dealing with a large subset (tens or hundreds of thousands of elements), it is sometimes difficult to give the users anything to navigate effectively through a combo box on the web, in order to find the element they are after. 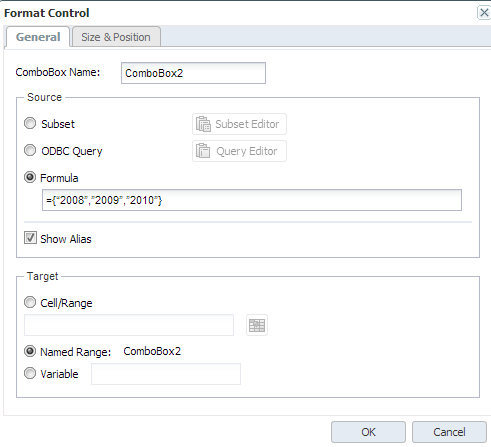 Using a text filter, the users can type into a cell the values that they would like to search for in the combo box filters down the elements to that list. It does not just return a straight list; it maintains the hierarchy structure and relationships in the combo box of all elements that satisfy the criteria. The kicker here is the capability to use the default search wildcards (eg *, ?) or use perl expressions. Perl expressions open opened up for me a big world of new type of filters that I previously unaware of. For example you can search for multiple criteria, exclude criteria, etc. This example is located here. Another example can be found on the web security template. On the report, you can see i have a toggle for users to switch per expressions on or off as they require. Although powerful, perl expressions can sometime confuse users, so it is best to have an option to turn it off or on. This entry was posted in Jedox Subsets, Jedox Web on October 6, 2013 by Chris Mentor. Thomas Arampatzis from the Jedox Academy was in town last week for some training. An interesting point that he touched upon with the students in relation to subsets was how the subset array works. Depending on the orientation and dimensionality of the array, you can retrieve different information from the subset. Below is an example of a simple subset using a hierarchy filter. If you paste out 2 columns into the spreadsheet, you get the alias as well. Helpful if you want to show an element code plus description in a report. This is very handy if you want to test the row for conditional formatting. You can bold and underline totals, for example. This entry was posted in Jedox Subsets and tagged Jedox, Naked Data, Subset on September 23, 2013 by Chris Mentor. You can pretty much go crazy with Subsets. You can make a report completely dynamic based on what the user selects. Technically, subsets are spreadsheet array formulas, which means that you have to use the ctrl+enter to apply the subset to a range and shift+ctrl+enter to un-apply it (or just delete it). You have the option of using the Subset Editor to develop the Subset formula, or you can have a go at writing it yourself (not recommended for young players). The great thing is, that because the wizard generates a formula, you can use the wizard to generate the formula and then modify it once you paste it out. or, a combination of any of these. 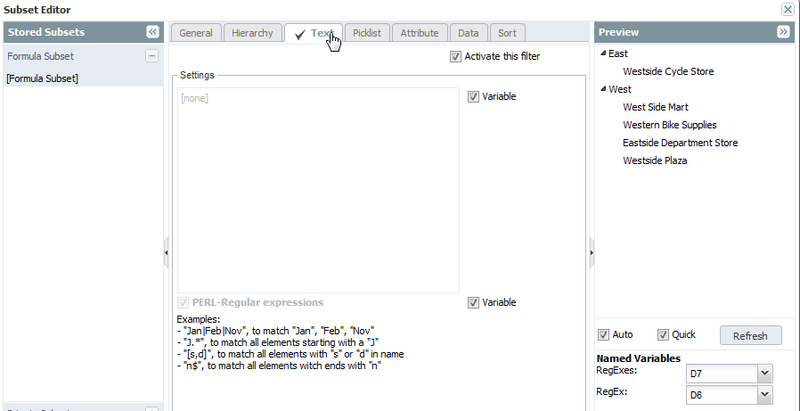 A lot of the components of the various filters accept ‘variables’. This allows you to specify cells, named ranges or Jedox variables on a spreadsheet to dynamically pass through into the subset, greatly expanding the functionality and flexibility. When you click paste, it writes out the subset formula that you can then use for your row elements. Check out this example here. It is a .wss file that you can import into Jedox Spreadsheet Manager. This is a very basic example, which allows you to double click on cell F8 (Region) and the children of this element will be displayed in Column A.
Subsets can be saved as either Private or Global. Global subsets can be shared with everyone with access to subsets, and Private are only available to the person who created them. There are some other subset related functions available, including SUBSETSIZE (which returns the number of elements in a subset ) and SERVER_SUBSET (which allows you to refer to an existing subset and its elements). The one thing to consider with Subsets, is that you need to define the maximum range of where the subset ends. In some situations this is fine and not an issue; but it can become messy if you need to format all the rows using conditional formatting to hide the fact you have some blank space under the returned values. The solution to this is to employ Dynaranges. Subsets work really well with Dynaranges and we will convert of a bunch of the different types of Subset filters in the context of Dynaranges. This entry was posted in Jedox Subsets and tagged Business Intelligence, Jedox, Jedox Subsets, Performance Management, Spreadsheet on September 19, 2013 by Chris Mentor.